Spinach Pakoras| Palak Pakoras| Spinach Fritters are my favourite. In my family everyone loves pakoras as I make onion pakoras quite often at home. 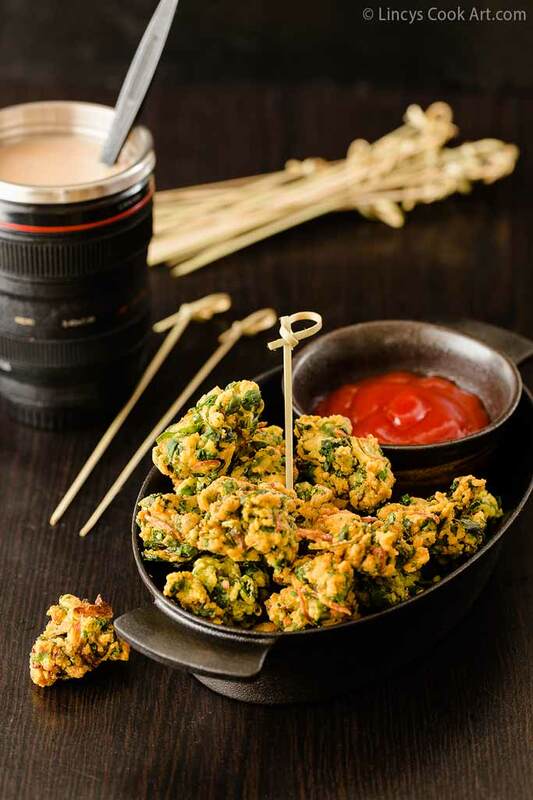 Almost same taste with the addition of spinach makes these yummy pakoras nutritious as well. The summer heat has gradually subsided and the weather is slightly turning pleasant and in the evenings I usually crave for some nice crunchy snacks to have it with my tea. Here we get nice snacks for cheaper prices at the time of Iftar to break the fast. 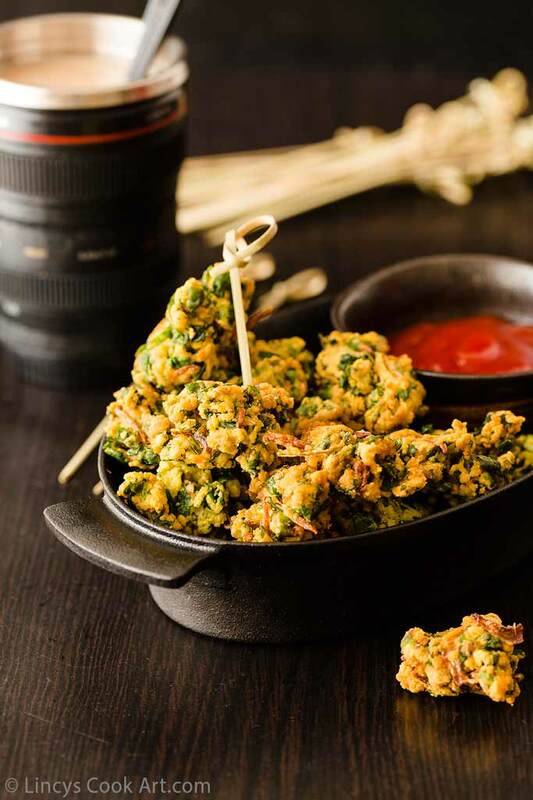 My hubby once bought some potato pakoras and some Jalebis from his office Iftar give away pack, and that made me to crave for more pakoras one evening and instantly made these yummy pakoras to fulfill my craving. These fritters are quick and simple to make snacks with in minutes. You could even store them for a day if you deep fry them well. Do try this recipe which is apt for this season!! Refer Onion Thool Pakora recipe here. In a pan heat the oil; meanwhile start to prepare the mix for pakoras. Wash and remove the thick stem from spinach and chop them into medium sized pieces. Chop the onion lengthwise and then chop the green chillies and finely chop the ginger. 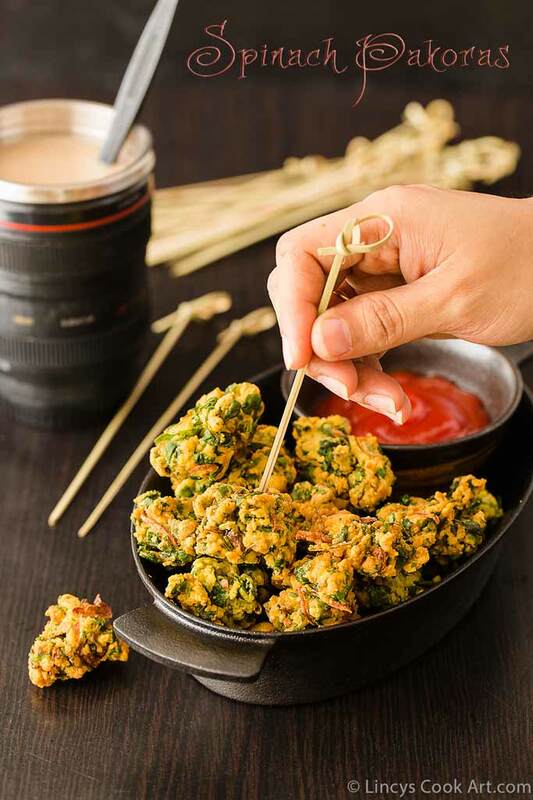 In a deep bowl add the chopped spinach and onion and then add the gram flour, rice flour, corn flour, green chillies, ginger, turmeric powder, red chilli powder, fennel seeds, ajwain, salt and 2 teaspoons of oil and knead well by squeezing with hand. Knead well till the moisture from the spinach and onion coats the flour. Now drizzle water a tablespoon at a time and again knead to make moist lumps. Do not make watery batter like bajji. It should be slightly thick but it should not be floury. You could make them into small sized ball and fry them. I like to make uneven sized bite size pieces. Once the oil is smoking hot reduce the flame and fry them on low flame till golden and crunchy. Remove the fritters from oil using a slotted spoon and drain the excess oil by using kitchen towel. Refer Onion thool Pakora recipe here. 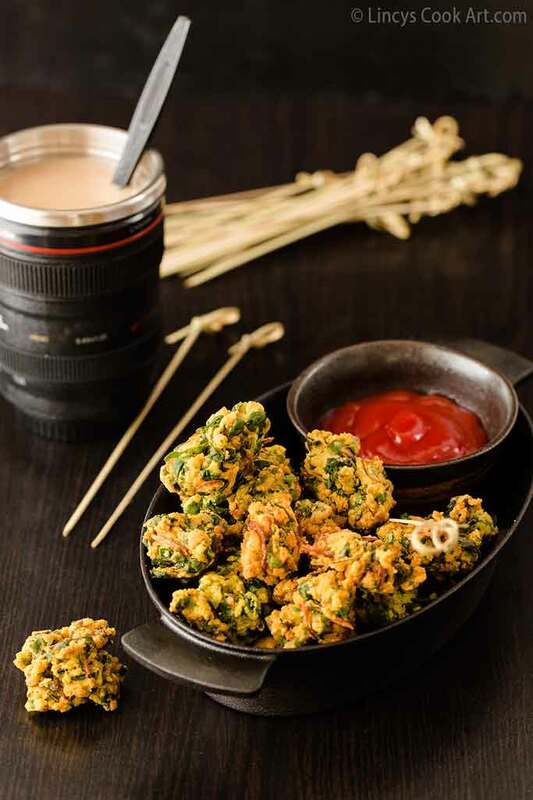 Adding corn flour in this recipe is optional but it keeps your pakoras crunchy for long time. You could replace corn flour with a pinch of baking soda or half a teaspoon of baking powder too.